From the East Kent Mercury, 27 April, 1983. 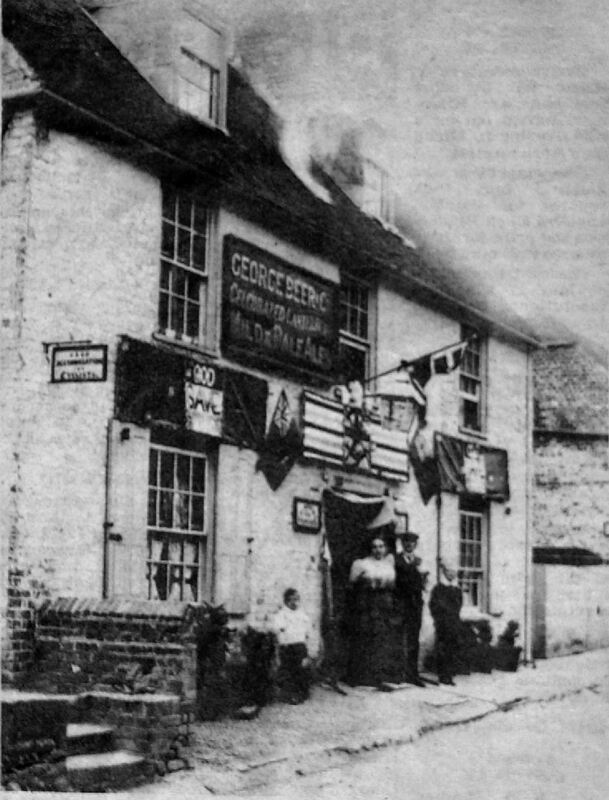 This excellent photograph of the "Coach and Horses" public house at Eastry is to be found in the Deal Maritime and Local History Museum. It is decorated, thought to be for the Coronation of Edward VII in 1902, but Steve Glover says he has seen the original dated 1911, meaning the licensee outside is John Press. Note the sign: Good accommodation for cyclists. From the Dover Express and East Kent News, Friday, 10 July, 1874. Price 1d. 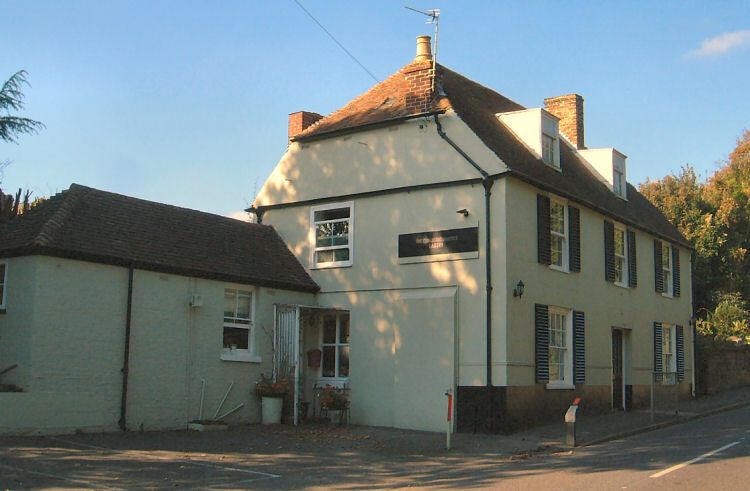 John Solly was summoned for refusing to quit licensed premises when requested to do so, at Eastry, on the 11th June. 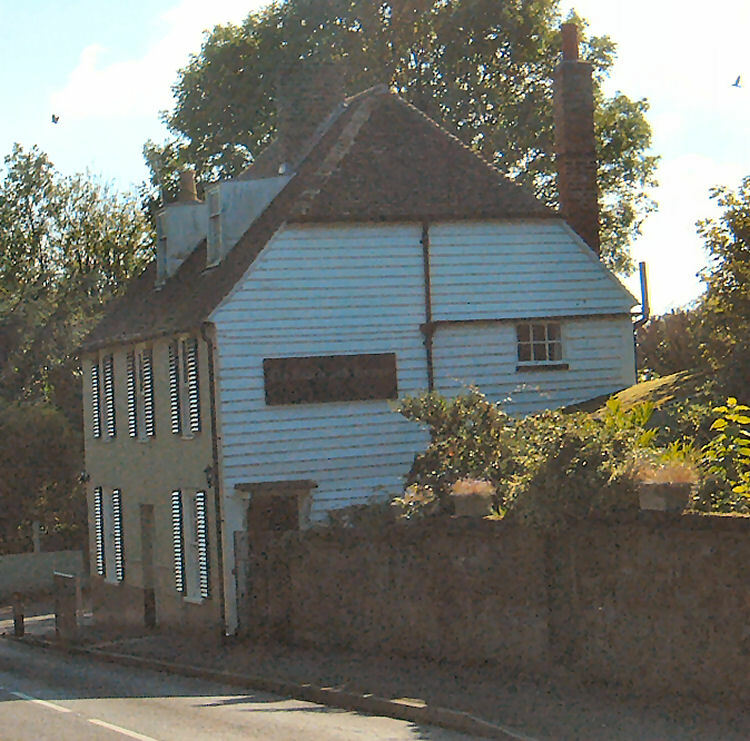 Berr, K.C.C., said that on the day named he was sent for to go to the “Coach and Horses” public house at Eastry. He was requested to turn the defendant out of the house. Defendant was drunk and witness requested him to go out, and as he refused he put him out. Defendant did not appear. Superintendent Noakes, in answer to the Bench, said the defendant had been convicted five times previously, and the Bench now fined him £4 and 11s. costs, or in default of payment to be kept to hard labour for two months. From the Dover Express and East Kent News, Friday, 19 September, 1902. Price 1d. B. Crump, "Coach and Horses" Eastry, has good accommodation for Cyclists. Teas and Dinners provided. Good stabling. From the Dover Express and East Kent News, Friday, 7 August, 1936. An occasional license was granted at the "Coach and Horses," Eastry, to sell in a tent at Hacklinge Farm, Worth, from 10 a.m. to 8 p.m. on August 13th, for the West Street Foxhounds Gymkhana. Dover Express 19 April 1946. FUNERAL OF MRS. J. W. PRESS. The death of Mrs. Margaret Ann Press, occurred on April 7th, Folkestone, at the age of 87 years. 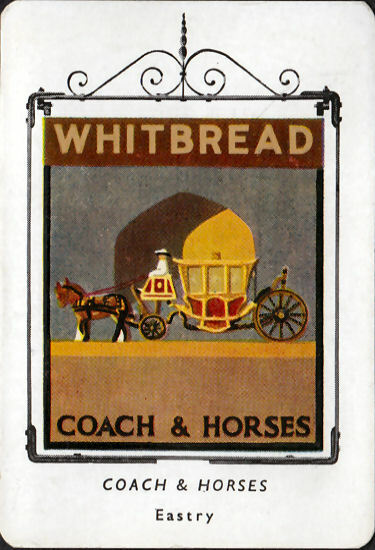 She was the widow of the late Mr. John William Press, who for many years was the licensee of the "Coach and Horses," Eastry. The funeral took place at Eastry, on Thursday, the Rev. F. J. Cartman conducting the service. She leaves one son and two daughters to mourn her loss. The mourners present were:- Mr. W. Press, (son) Mrs. Atkins (daughter), Mrs. and Miss Finn (nieces), Mrs. Holme, Mrs. May, Mrs. Howard and Mr. Milton (friends). Dover Express 23rd August 1946. An inquest was held at Deal Town Hall on Wednesday by the Deputy Borough Coroner (Mr. E. C. Allfree) on Frederick Thomas Hoile, aged 68 years, of Lower Street, Eastry, a farm labourer, who died in Deal Hospital on Sunday, from injuries sustained in an accident on August 10th. Mr. J. R. Ellison (Sandwich) represented deceased’s relatives and Mr. W. Mowll appeared for the East Kent bus driver, whose vehicle was in the vicinity. Walter John Hoile of Witherden Hall, Wingham, said deceased was his brother. He was a bachelor. His sight and hearing were good. Dr. Audrey Hazelden, Resident Medical Officer, Deal Hospital, said that, when deceased was admitted, he was suffering from profound shock and had a scalp wound in the left temple region. He died on 17th August from toxemia, with a fracture of the skull a contributory cause. William Press, Belle View, Mill Lane, Eastry, a painter, said that, at about 10.40 p.m. on August 10th, he was proceeding home from the “Coach and Horses”, Lower Street, in the direction of Sandwich, walking on the left hand side of the road. He and his wife were about 50 yards from the public house when he heard a motor cycle behind him, saw the light and got behind his wife in the gutter right up against the edge of the bank. His wife was not hurt or knocked down. When he came to, he saw a man (deceased) being held up in the gutter. He did not know what had knocked him down. Thomas Anthony Loftus of 6 Coastguard Cottages, East Cliff, Dover, an East Kent bus driver, said that, when he saw a motor cycle light approaching, he dipped his headlights. The light veered towards the bus and appeared to go to the ground. Reaching the spot, he saw a motor cycle on his (witness’s) off side of the road and the rider attempting to get himself away from the machine. Another man was half sitting up at the side of the road with a woman by his side. Deceased was nearer the bank, lying with his legs towards Dover. William Edward Sutton of 23 Mapleton Road, Ramsgate, the motor cyclist, said he was travelling from Dover to Ramsgate. Proceeding up the hill into Eastry, the lights of an approaching double decker bus dazzled him. He could not see ahead between the bus and his near side bank, so slowed down considerably. Almost immediately, he felt a bump on the left ---- something struck his elbow--- and he remembered nothing further until he was standing up in the road watching his motor cycle being propped up against the bank. Mr. Mowll: Why didn’t you stop? Witness: I knew no on was there. Mr. Mowll: You guessed it. Summing up, the Coroner said he concluded the bump on the motor cyclist’s elbow was the collision with deceased. He was satisfied no jury would find Sutton so criminally negligent as to justify a verdict of manslaughter, but he was not prepared to say he was free of all blame. Had he complied with the Highway Code, there would have been no accident. It was a pity deceased did not also comply with requirements of the Code set out for pedestrians. If the regulations were observed more carefully, less people would be killed on the roads. Above card issued March 1955. Sign series 4 number 10. Now just a restaurant. Oct 2007.